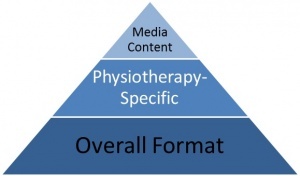 There are three things to consider for every Physiopedia page that you work on. Does the title already exist? Run a search for the page you want to create, or scan through the full list of Physiopedia articles. No template for the page you want to make? Use the new page template and create your own subheadings. Did I cite references using the 'cite' tool in the editing toolbar? Be sure to read about Referencing. Physiopedia is a universally accessible, online resource specifically created for physiotherapists around the world. A good page, then, should convey knowledge of the profession and current best-evidence practice. Have I included sections/ headings that are relevant to physiotherapy? Good examples of this include: Pathology/Injury, Physiotherapy Techniques (Palpation, Stretch, Treatment techniques), Clinical Examination (such as Differential Diagnosis, Special Tests and Outcome Measures) and Physiotherapy Management/Intervention. These sections are generally included in the templates. Have I referenced journals/ articles/ books specific to physiotherapy? The most physiotherapy specific information will come form physiotherapy specific texts, be sure to consult these. Have I made the content clinically relevant? Every page should provide information that can potentially impact a persons clinical practice. For example: have you described evidence based physiotherapy interventions for a condition; have you stated why it is important to know about a specific part of the anatomy i.e. how a ligament gets injured; have you demonstrated how to do a special test and stated when it is effective to use that test. Physiopedia is designed to be an educational and clinical tool, so visual references (including relevant images, videos and presentations) are great ways to enhance an article. Images: Anatomy/anatomical, pathology/injury, diagrams, illustrations, etc. Videos: Handling or rehabilitation protocols, exercises, or manual techniques (palpation, massage, range of motion). Lectures & Presentations: Anatomy/anatomical, clinical practice guidelines, physiotherapy management, diagnosis, imaging, etc. Be media that you have specifically had permission to use.